Chex Mix is an American institution. Not only is this a tasty snack great for munching on when watching TV, but it can also be used in an unlimited number of recipes. Containing a whole mixture of goodies, including cereals, rye chips, breadsticks, pretzels, nuts and crackers, Chex Mix is as versatile as it is tasty. Furthermore, compared to other snacks, it is incredibly nutritious. Packed with fibre, protein, vitamins and minerals, but low in fat, and with zero cholesterol, Chex Mix makes for a healthy snack treat. 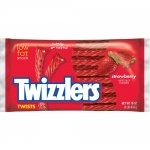 This large bag, containing 8.75 ounces (248 grams), will last for a while, but with the number of ways you can serve this healthy snack, there is a good chance you’ll be back for more. Chex Mix has been an American staple for over 90 years, providing a healthy alternative to crisps and other snacks, but also providing a great base ingredient for all sorts of recipes, such as cakes, muesli and salads. 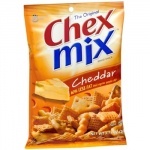 Great for parties and sharing, this large bag of Chex Mix is versatile, tasty and healthy. Enjoyed by adults and children alike, Chex Mix is a great way of giving the kids a treat, while avoiding the sugar and fats found in other snacks. 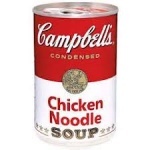 Flour Enriched Bleached, Wheat Flour, Iron Ferrous Sulfate, Niacin, Riboflavin Vitamin B2, Thiamine Mononitrate Vitamin B1, *Corn Meal Degermed Yellow, Folic Acid Vitamin aB, Malt, Soybeans Oil Partially Hydrogenated, Rye Flour, Salt, Sugar, Wheat Whole, Produced from genetically modified maize. **May have an adverse effect on activity & attention in children. This is my all time Favourite Snack. 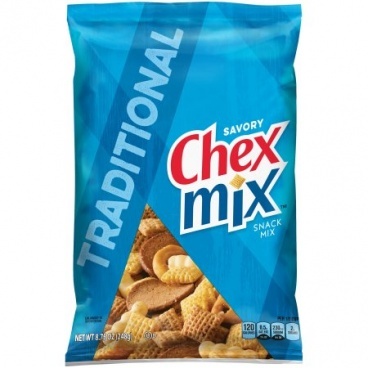 Love Chex Mix all varieties.